Device Tracker is an enterprise-grade software solution that helps customers track and find lost and misplaced Zebra Android mobile devices. Part of Zebra’s Mobility DNA suite of value-add applications, this solution is easy to deploy — and there is no additional infrastructure for customers to purchase and manage. This solution is complimentary as part of a Zebra OneCare support contract, providing an always available web-based device tracking dashboard and presence information for all of your customer's WiFi connected Zebra Android devices. Just download and install the Device Tracker application on any server in your corporate environment and deploy the Device Tracker Client application on the supported Zebra Android devices* you want to track — Device Tracker does the rest. The Device Tracker software is available as part of your Zebra OneCare or Technical Support Service (TSS) contract. Just download the server and mobile client applications from your Zebra Support and Downloads page. And since Device Tracker uses the devices and network infrastructure you already own — including Wi-Fi — there are no extra costs. View premise-level presence status for your supported Zebra Android devices anytime through the Web-based dashboard. And you define how frequently your dashboard is updated, based on the needs of your business — such as every five minutes or the beginning and end of every shift. The easy-to-read dashboard in the Device Tracker application allows your IT and facility administrators to see the status of all tracked devices, complete with alerts that identify devices that exceed your pre-defined thresholds. These alerts are triggered when devices have not reported into Device Tracker for a specific amount of time, and when battery level dips below your selected threshold. 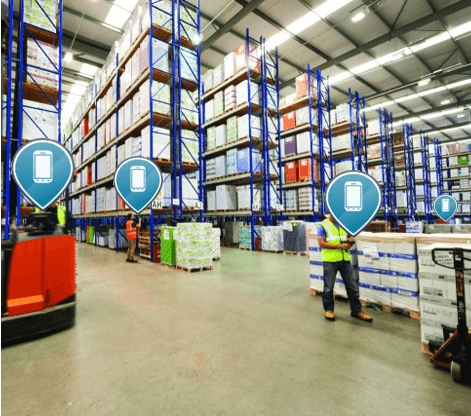 Whether you have a large warehouse or a small store, if your device is connected to your WiFi network, Device Tracker will help you track it. Available information includes the name of the device and the access point to which is it connected, remaining battery charge level, the time of the last report and any alerts associated with a device. And since you can see how many devices are in service at the start of every shift, you can ensure all devices are returned at the end of every shift. Turn any supported Zebra Bluetooth Low Energy (BLE)-enabled Android mobile device into a Geigercounter to easily find a missing device. Just open the Device Tracker app to see which access point the device is currently connected to, identifying the general area where the device is located (note that access points can be labeled with intuitive names, such as Sporting Goods or Cosmetics). The BLE-based proximity indicator identifies whether you are moving closer to or farther from the device. In addition, you can remotely ring the missing device at any time, making it easy to find devices that may be hidden from view. The Device Tracker Client application securely connects to the server, ensuring that you can always track and find your devices — without compromising security.